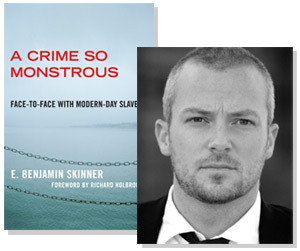 Reading Benjamin Skinner's book A Crime So Monstrous: Face-to-Face with Modern-Day Slavery was a sober experience, yet I couldn't put it down. It's a well-written, thoroughly reported investigation into modern-day slavery (or as the Bush Administration euphemistically calls it, "Human Trafficking") with first-hand accounts of the slaves Skinner got to know on his four years of travel across the globe—from Haiti to India and Moldova to, yes, Miami. The book gave me nightmares but it also inspired me to call attention to this subject—I plan to write my senators (one of whom is still running for president) as well as make donations to Free the Slaves, the abolitionist group run by Dr. Kevin Bales, a slavery scholar and author of "Disposable People." As Samantha Power, who blurbed the book, says: "A Crime so Monstrous is the rare book that doesn't simply expose these harms; it also explains how and why decent people inside and outside the U.S. government have averted their gaze, and it showcases those who have devoted their lives to curtailing a shockingly prevalent crime against humanity. Skinner has written an anguishing book, but also an inspiring call to action." Oddly, reading Skinner's book and talking to him for this Q&A in Salon coincided with my watching the second season of "The Wire," which revolves around the unsolved mystery of a shipping container of Eastern European "Jane Does" who Jimmy McNulty thinks were intentionally suffocated before being inducted into a (no doubt slave) brothel in Baltimore. Slavery, which before I read "A Crime so Monstrous" was invisible to me now seems to be lurking around every corner. Start by buying Skinner's book--you'll be just as appalled and enraged as I was.